RADIO WITH HEART. Pictured above is Rene Gonzalez, one of the “Cuban Five”, in Havana, Cuba, June 2013. Rene at the time was the only member of the Cuban Five who had been released after almost two decades in U.S. prison. 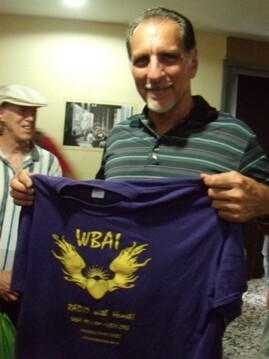 Mr. Gonzalez praised WBAI’s fair reporting on the case of the Cuban Five and appreciated the t-shirt (designed by WBAI’s Uncle Sidney Smith) that Mitchel Cohen gave him. (Man in background is jazz pianist, Oakland activist and writer William Crossman.) All the Cuban Five are now free. To hear Mitchel’s interview with Cuban Five attorney Len Weinglass (now deceased) click here. WBAI is in crisis, as is the entire Pacifica Network. The Local Station Board has done shamefully little to address the problems that beset us — and, for that matter, most radio stations. Instead, some at national Pacifica, which owns WBAI’s license (as well as others in Berkeley, Houston, Washington D.C., and Los Angeles), have caved-in to powerful U.S. government and corporate forces and are calling for shutting down WBAI and breaking up the network! Sale of WBAI, they figure, would net them tens of millions of dollars that, they say, could be used to save the rest of the network. FIX THE PROBLEMS AND STRENGTHEN THE NETWORK, DON’T BREAK IT UP! The station is in desperate shape financially. WBAI’s rent for the antenna atop the Empire State Building runs around $55,000 per month. We finally forced the station to move out of Wall Street (saving around $30,000 per month). We’re looking to build studios in that building, and re-unite the administrative and broadcast arms at one location. We’re exploring ways to use WBAI’s new website to expand the station’s reach. Volunteers have been tremendous in all facets of the station’s operations, especially, right now, getting out the premiums that listeners have already ordered and paid for. WBAI needs your help! Please contact VOLUNTEER@WBAI.org and we’ll get back to you promptly. And ….. thank you! Please check out the analytical essays listed in the sidebar on the right . Note: Last month, it was discovered by Pacifica National Board Secretary Janet Kobren that Former Pacifica National Board Chair Margy Wilkinson and former Director and Chief Counsel to the Pacifica Foundation Dan Siegel had, two years earlier, set up and registered a not-for-profit corporation titled “KPFA Foundation”. They told no one about this, including the other directors of Pacifica, and did this while they were in positions of authority and responsibility at Pacifica. On September 10, 2015, one of WBAI’s elected directors to the National Board, Steve Brown, filed a Motion to Censure Margy Wilkinson for her involvement in those acts. This is my motion on the agenda of tonight’s (Thursday) publicly streamed Pacifica National Board meeting. It is for censure of a Pacifica board member (and former chair) for behavior deliberately intended to harm Pacifica for the sake of personal advantage or financial gain. I expect (of course) the meeting to run out of time before the motion ever reaches the floor. At the board session earlier this evening – closed to the public — my motion to fire attorney Dan Siegel and his law firm (for colluding with the former board chair) was also never able to reach the floor. Fortunately, I am still young, and at some future meeting, say, in 2070, those agenda items will be addressed. Meanwhile, below is the motion to censure former Pacifica chair Margy Wilkinson. At this time, I am moving only to censure board member Margy Wilkinson – instead of proposing to remove or expel her from the board, as I believe is justified – because removal or expulsion of a board member is a much more complex and time-consuming procedure, which, however, I intend to initiate in the near future. The case against Margy Wilkinson seems clear. She has breached the duty of care, loyalty and disclosure by which she is bound as a fiduciary of the foundation, and has acted with apparent intent to harm Pacifica by colluding with Pacifica’s legal counsel, Dan Siegel, to destroy the stability and finances of the corporation for personal advantage and/or financial gain. Prior to my bringing this motion, there were of course numerous complaints about Margy Wilkinson (and Dan Siegel) – often by board members – about alleged financial irregularities or improper behavior. But such complaints were brushed off by attributing them to “factional” disputes. Or, in the case of complaints about behavior by Wilkinson and Siegel that seriously harmed Pacifica, such behavior was (charitably) attributed to poor judgment or incompetence. However, I believe that what is presented below will demonstrate that neither factionalism nor incompetence is at issue. I believe that it will now be possible for you to view this and prior complaints against Wilkinson (and Siegel) in a new light, one that reveals their harmful behavior to be – not inadvertent – but intentional. (1) ATTEMPTING TO HIJACK CORPORATE ASSETS. In addition to co-opting, without permission, Pacifica’s legally trademarked name of “KPFA,” Wilkinson and Siegel’s shadow corporation listed as its mission (in its articles of incorporation) the identical ‘mission statement’ of Pacifica, copied word for word from Pacifica’s own articles of incorporation. It should be noted that Margy Wilkinson did not disclose the existence of her shadow corporation to other Pacifica board members at that time, or to Pacifica’s then-executive director; nor was its existence disclosed to current board members, or to the current executive director, John Proffitt – until Margy Wilkinson’s corporation was accidentally discovered, by Pacifica’s Secretary, on July 30, 2015, nearly two years after its incorporation. When questioned about the purpose of the secret “KPFA Foundation” that he and Wilkinson had formed, Dan Siegel admitted in an email that its purpose was to acquire the licenses and assets of Pacifica stations in the event that the Registry of Charitable Trusts acted to dissolve the Foundation and/or strip away its nonprofit status. But Siegel is on record as desiring to dissolve Pacifica, in order to wrest his local station (KPFA, in Berkeley) from its control. Consequently, Wilkinson and Siege have, for the last two years, actively worked to bring about that very dissolution of Pacifica by the Registry of Charitable Trusts – so that their “KPFA Foundation” could scoop up Pacifica’s licenses and assets, recently valued at more than $100 million. Therefore, we see that the clandestine creation of “KPFA Foundation” by Wilkinson and Siegel reveals, not only the intent to hijack Pacifica’s licenses and assets, but also the method. (2) INTENTIONALLY CREATING A CONFLICT OF INTEREST TO HARM PACIFICA. Although Margy Wilkinson knew of Dan Siegel’s public statements in favor of dissolving Pacifica, she nevertheless, in her capacity as board chair and executive director, appointed Siegel (her partner in “KPFA Foundation”) as Pacifica’s de facto corporation counsel. She granted him authority to oversee and/or handle most or all of Pacifica’s legal affairs, including a number of important disputes now pending, whose outcome could severely impact the well being of the foundation by exacerbating its already frail financial condition. Wilkinson did this knowingly, creating an improper conflict of interest, in which the attorney she had appointed to negotiate on behalf of the foundation’s well being, was publicly committed to the foundation’s destruction — and therefore, presumably, would be uninterested in negotiating the best legal outcomes for Pacifica, in order to hasten its decline, so that his and her “KPFA Foundation” could acquire the assets and broadcasting licenses of Pacifica, which, as noted above, are worth more than $100 million. B) A member should not accept or continue representation of a client without providing written disclosure to the client where: 3) the member has or had a legal, business, financial, professional or personal relationship with another person or entity the member knows or reasonably should know would be affected substantially by resolution of the matter. Perhaps nothing better reveals Margy Wilkinson’s intent to harm Pacifica than the fact that her appointment of Siegel to handle Pacifica’s legal affairs occurred at a “special” session of the board to which (contrary to law) “unfriendly” board members had not been invited – or from which they had been deliberately excluded. (3) SELF-SERVING CANCELLATION OF FOUNDATION ELECTIONS. Elections for local station boards, which ultimately determine who sits on the national board, were cancelled in 2014 for reasons that are still suspect and hotly debated. At that time, Margy Wilkinson’s term as a board member (as well as board chair and executive director) would have come to an end. She would then have had to seek re-election, with a very good chance of losing – which would have rendered her powerless to continue destabilizing Pacifica for the benefit of her “KPFA Foundation.” So (contrary to our bylaws) Wilkinson arbitrarily cancelled the 2014 elections. As a result, Margy Wilkinson was able to retain her control of Pacifica for an additional year, as chair and executive director. Now it appears that, with the help of the same group that supported her previously, the 2015 elections may also be cancelled, allowing Margy Wilkinson to continue as a board member for another year, so that she may continue to destabilize Pacifica for the ultimate advantage of her shadow “KPFA Foundation.” The reason given for the current indefinite postponement of the 2015 elections is supposedly “insufficient cash” to pay for postage to mail the ballots. However, this is not borne out by an examination of Pacifica’s balance sheet. (4) FAILURE TO FILE TIMELY AUDITS IN VIOLATION OF MANDATED REQUIREMENTS. (ii) Failure to file a timely audit each year also causes Pacifica to forfeit its funding from the Corporation for Public Broadcasting (CPB). Pacifica’s failure to file timely for the past two years has caused it to forfeit CPB funding amounting to more than $2 million, which is an enormous sum for a corporation of our size. Moreover, it appears likely that Pacifica will also lose another $1 million of CPB funding, because the FY2014 audit has still not even started, and is already past due. Given the dire consequences of failing to file timely audits, none of Margy Wilkinson’s reasons for failing to do so make even the remotest sense – unless they are viewed as part of a pattern, part of a plan to bring Pacifica down by pushing it into insolvency, so that her “KPFA Foundation” could acquire its licenses and assets. That this was her intent is made even clearer by her deliberate re-hiring, over protests from numerous board members, of a Chief Financial Officer who had been let go by the prior board for cause, and whom she knew was not professionally competent to produce an audit – as his failure to produce the required audits revealed. Margy Wilkinson intentionally concealed, from the national board and the executive director, the existence of a corporation that she had created, in secret; a corporation that not only co-opted, without permission, the entire Pacifica mission statement, but also the trademarked Pacifica name of “KPFA”; a corporation whose purpose was admitted by one of its founders to be the acquisition of Pacifica’s licenses and assets in case it was dissolved – a dissolution that Wilkinson appeared to be diligently working to bring about, since her co-founder of “KPFA Foundation” was Dan Siegel, who is on record as desiring the dissolution of Pacifica. Because the foregoing demonstrates a severe breach of the duty of care, loyalty and disclosure by which Margy Wilkinson is bound as a fiduciary of Pacifica, I move that she be censured by this body.